I tried something brand new today - Urban Float. It was awesome! What is Urban Float? 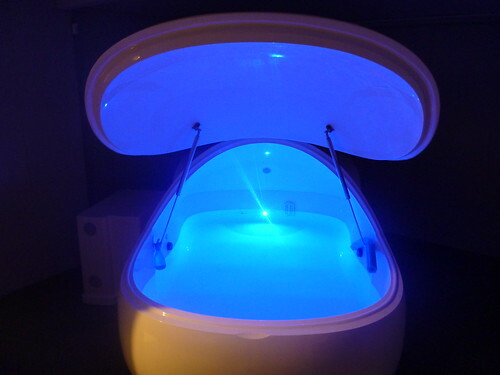 It's a sensory deprivation/isolation tank, think Altered States. I love the eerie, blue glow. Here is what the pod looks like with a flash. Since today was my first time I went for a little run before showing up. I thought it would be tough for me to relax for 60 minutes plus, why not do something really comfy after exercising? In retrospect this was a good idea. Being a newbie I started with an orientation video and then I was shown my room which was just like a private spa. I took a quick shower and got in the pod. 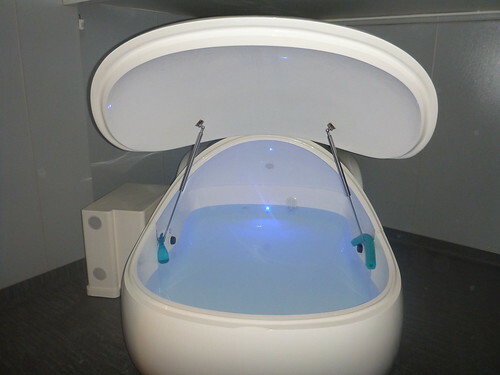 The water in the pod and air in the room is body temperature so descending into the water is almost imperceptible. 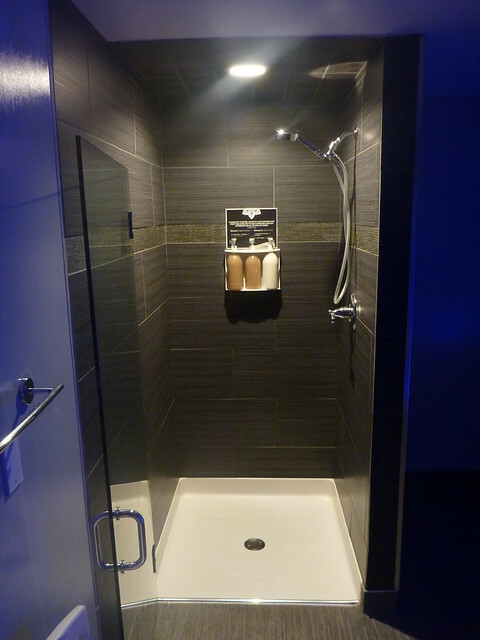 You have ear plugs to keep the salt water out if you turn the room lights off and the pod light off, it is DARK. At first I wouldn't believe that the water would suspend me sufficiently and I kept tensing my neck muscles in an attempt to keep my head but it's not necessary. This happened over and over and every few minutes I would be able to relax some other part of my body until perhaps 20 minutes in I was finally not fighting the suspension. And the suspension is massive! A couple of times I would push my head or hand or hips down and the water pushed them back up immediately. It was like laying on a million little springs except there were no pressure points. Super fun! When you first lie down your body is like a cork and you bounce off the pod's walls a couple of times before you settle into the middle. I'm 6' 2" and I'm going to guess the pod is a maximum of 7' long so in spite of me always being mere inches from the edge I'll cop to reaching out a few times so I could touch the wall as I lost all perspective and sense of space in the dark. The longer I was floating the easier it was to be there. At fist my mind was racing and thinking of all kinds of things but eventually I actually tried to sleep (I wasn't tired enough) and then just let my mind drift without worrying about what was happening. ASIDE – after getting out the pump next to the pod turned on and started cycling the water. Just so you know it's fresh for every person. Another quick shower to rinse off all the salt and I walked outside feeling pretty damn relaxed. It's not like having a massage, it's more like any residual stress or tension is gone. I suspect we are all constantly flexing unnecessary muscles and we don't even know it, this removes that. I had a couple of scrapes from a trail running fall when I got in and they stung for about 20 minutes because of the salt. After getting out I saw that they provide some cream to cover cuts and scrapes. Nice. They also provide the ear plugs and super fluffy towels. I can't wait to go back, what a great way to treat yourself.